Evia, pronounced "effia", is also known as Euboia. It's is Greece's second-largest island, just after the big island of Crete. But for most foreign travelers, Evia's almost invisible on the travel radar. Yet this Greek island is very easy to get to, has great culinary traditions, hot springs, and interesting archaeological sites. Where Is Evia and Who Goes There? Evia is located along the east coast of mainland Greece, not far from Athens. Even for more timid drivers, it's a relatively easy route along the wide highway leading from Athens to Thessaloniki. There is a bridge over to Evia at Chalkidiki and a car and passenger ferry between Arkitsa on the mainland and the spa town of Edipsos or Aedipsos on Evia itself. A similar ferry operates between Glyfa on the mainland and Agiokambos. If you're coming from Athens, Arkitsa will be more convenient. From Thessaloniki, the Glyfa ferry will be the better choice. Evia is one of the "secret" islands that the Greeks seem to keep for themselves. In general, it will be a less-touristy, more "Greek" experience. Most people working in the service industry will speak English, but you may encounter a few who don't and you may actually get some use out of that Greek language cheat sheet or want to learn the letters of the Greek alphabet before you go. Evia is renowned for its seafood and handcrafts. Like Crete, Evia has many small mountain villages in beautiful settings. They often have local handicrafts and unusual food products, and many of them have significant chapels worth finding "the lady with a key" to open them up so you can take a look around. It's customary to leave a coin in the coin box and I like to give one to the key keeper as well. Like thermal springs? There are several sites which offer mineral baths. The most developed is at Edipsos. One thermal option is the luxurious Thermae Sylla hotel. Check out more on natural spas and springs throughout Greece. The extensive ancient site of the city of Eretria in the southern portion of the island is open to visitors. One very reasonably priced foodie-friendly trip to Evia is from Culture and Cuisine in Evia, a company which focuses on exploring Evia and delving deep into its food traditions. Their trips start and end in Athens and provide transportation to and from Evia itself. 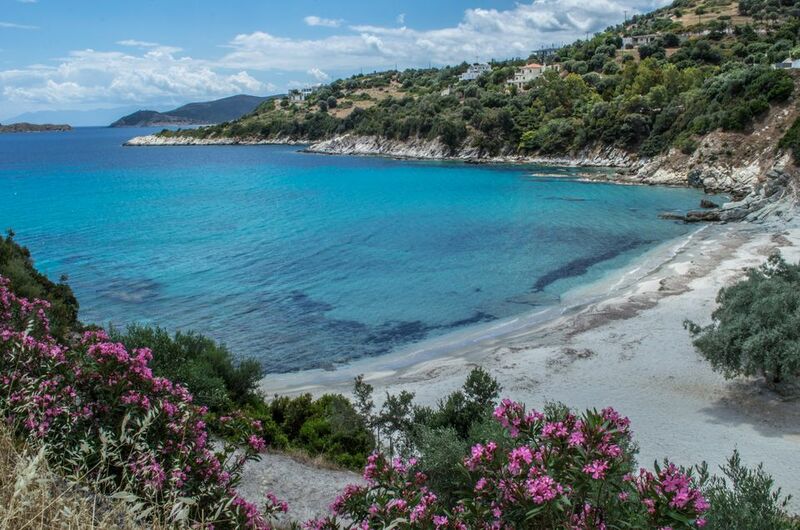 Another option is to explore the coastline of Evia on a yacht-based tour which can provide an affordable and unique way of looking at the coastline. Evia has a wide variety of places to stay. Most hotels in Edipsos are near the hot spring spas or provide their own.